An underwater research team has discovered the shipwreck of a military cargo vessel made by the Russians in 1915 in Lake Van, located in Turkey's eastern Bitlis province, reports said on Thursday. After almost 18 months of research, the team found the 100-year-old Russian vessel, which was used for military freight shipment, and ran aground 23 meters down Lake Van during a storm in 1958. The vessel is reportedly 40 meters in length and is still in good condition, despite the fact that it hit rocks before it sank. Underwater Cinematographer Tahsin Ceylan, Lake Van Underground Research Association (VANSAD) Chairman Dr. Mustafa Akkuş and six more members of the team have been conducting research off Çanakdüzü coast in Reşadiye district, Bitlis, the Doğan News Agency reported. 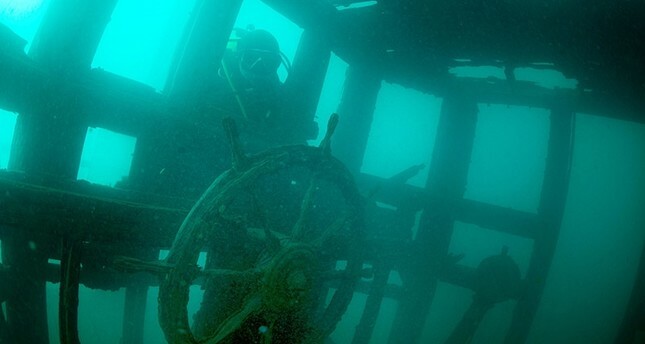 The finding marks the first time a sunken-ship has been discovered in the lake. Cinematographer Tahsin Ceylan said that the lake is full of 'mysteries' and the team is working collectively to solve these mysteries. "We learned that there are three cargo vessels from the 1900s, which sank around Bitlis region" Ceylan said. He continued by adding that they would love to work with a Russian team to find out the rest of the remaining shipwrecks under Lake Van.